The Black Panthers are looking for a positive result against the Shillong based side. Mohammedan Sporting Club are looking to put their disappointing defeat to TRAU FC behind them, when they host Langsning FC in a Preliminary Round Group C encounter of the 2nd Division League at Barasat Stadium on Monday (April 9, 2018). The match will be kicked-off at 3:15 PM. The Black Panthers had a superb start beating Jamshedpur FC and Chennaiyin FC in their first two fixtures, but have moved to the third position on the log after the defeat in Imphal. While the Black Panthers looking to redeem themselves after suffering their worst defeat of the season, Head Coach Biswajit Bhattacharya remains confident that the team will bounce back from their poor performance. “The loss was a setback but still there is a long way to go. The players have put the disappointment behind and fully focused on the upcoming home game against Langsning.” Coach Bhattacharya said. “Langsning are a young team with full of energy. We will treat them with respect. We have to put up some good work and make sure that we take care of their strengths.” Coach Bhattacharya commented about their opponents. Despite losing to TRAU, the Black Panthers played a good brand of football and were let down by their finishing in the last third, with one such noticeable player being Fikru Teferra Lemessa, who time and again found himself in good space but failed to convert. The former Ethiopia skipper will, however, aim to rectify his mistakes against the Shillong-based side who beat Jamshedpur FC 3-1 midweek. “It happens in football. Sometime you don’t get the desired outcome despite doing all the hard work. We must not panic. If we keep worrying about what has happened in the past we will struggle in future. It will be a different game tomorrow and we are looking forward to it.” Fikru said. 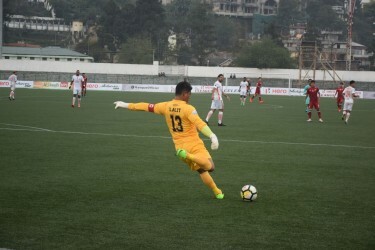 Though Coach Bhattacharya has ruled out making drastic changes to his side for Langsning game, but he could be forced to ring changes in the goalkeeping department after Suvam Sen conceded four goals against TRAU rather cheaply. Meanwhile, Langsning Head Coach Herring Shangpliang explained that Mohammedan SC will be eager to bounce back from their loss to TRAU and this will make things more difficult for his team. “I believe we will give a good account of ourselves even though we know that Mohammedan SC will be eager to bounce back. It is an opportunity for us to rise to the occasion,” he added. Mohammedan SC have six points from 3 games and they are on thrid position in Group C just behind Langsning who are on 7 points from 4 outings.